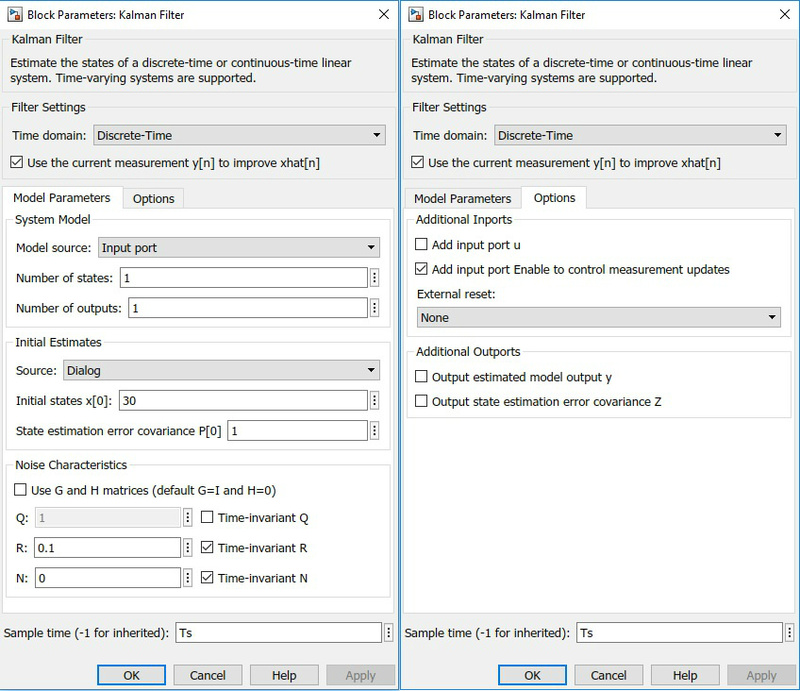 This example shows how to estimate the states of a nonlinear system using an unscented Kalman filter in Simulink™. The example also illustrates how to develop an event-based Kalman filter to update system parameters for more accurate state estimation. This example uses functionality from System Identification Toolbox™ and Simscape™, and does not require Predictive Maintenance Toolbox™. The model consists of a voltage source , a series resistor and a single RC block and . The battery alternates between charging and discharging cycles. 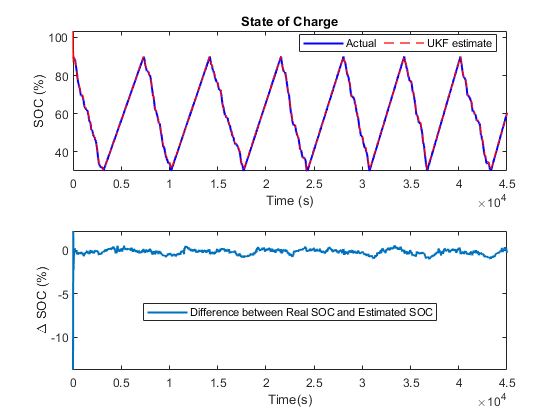 In this example, you estimate the state of charge (SOC) of a battery model using measured currents, voltages and temperatures of the battery. You assume the battery is a nonlinear system, estimate the SOC using an unscented Kalman filter. The capacity of the battery degrades with every discharge-charge cycle, giving an inaccurate SOC estimation. Use an event-based linear Kalman filter to estimate the battery capacity when the battery transitions between charging and discharging. The estimated capacity in turn can be used to indicate the health condition of the battery. 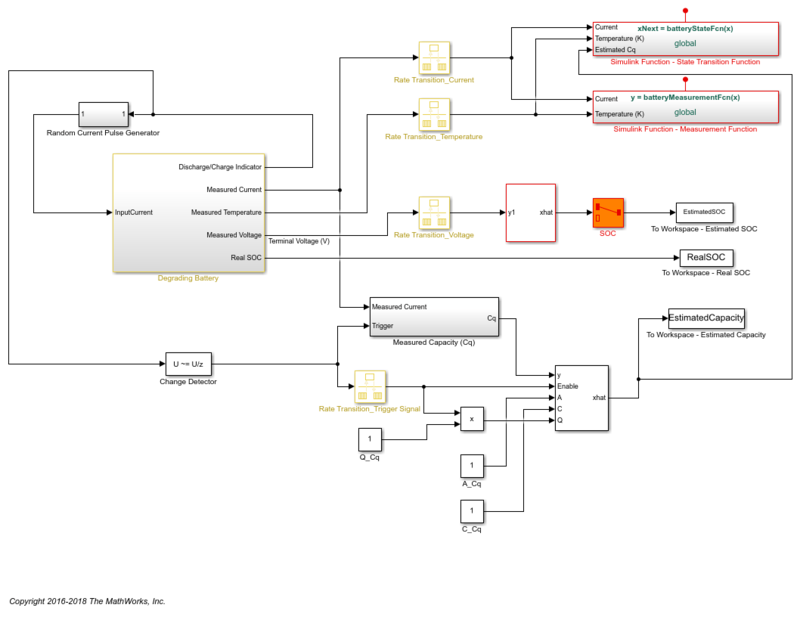 The Simulink model contains three major components: a battery model, an unscented Kalman filter block and an event-based Kalman filter block. Further explanations are given in the following sections. The battery model with thermal effect is implemented using the Simscape language. where and are the thermal and SOC dependent resistor and capacitor in the RC block, is the voltage across capacitor , is the input current, is the battery temperature, is the battery capacity (unit: Ah), and is the process noise. The input currents are randomly generated pulses when the battery is discharging and constant when the battery is charging, as shown in the following figure. where is the measured voltage output, is the serial resistor, is the electromotive force from voltage source, and is the measurement noise. The discretized state transition equation is implemented as a Simulink function named "batteryStateFcn" shown below. The function input x is the state vector while the function output xNext is the state vector at next step, calculated using discretized state transition equations. You need to specify the signal dimensions and data type of x and xNext. In this example, the signal dimension for x and xNext is 2 and the data type is double. Additional inputs are the temperature, estimated capacity, and current. Note that the additional inputs are inputs to the state transition equations and not required by the UKF block. The measurement function is also implemented as a Simulink function named "batteryMeasurementFcn" as shown below. 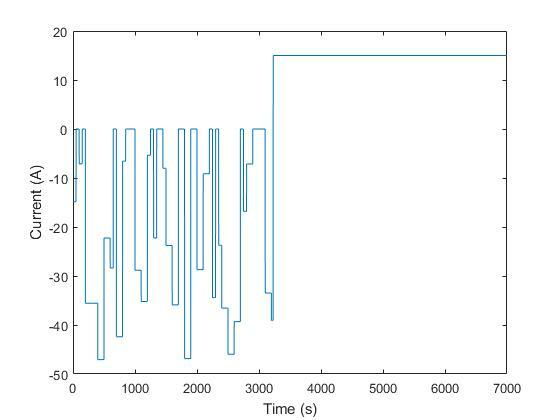 Process noise: Additive, with time-varying covariance . The Additive means the noise term is added to the final signals directly. 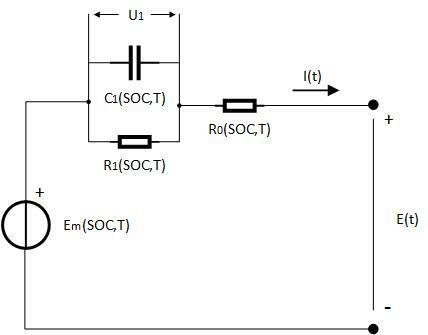 The process noise for SOC and are estimated based on the dynamic characteristics of the battery system. The battery has nominal capacity of 30 Ah and undergoes discharge/charge cycles at an average current amplitude of 15A. 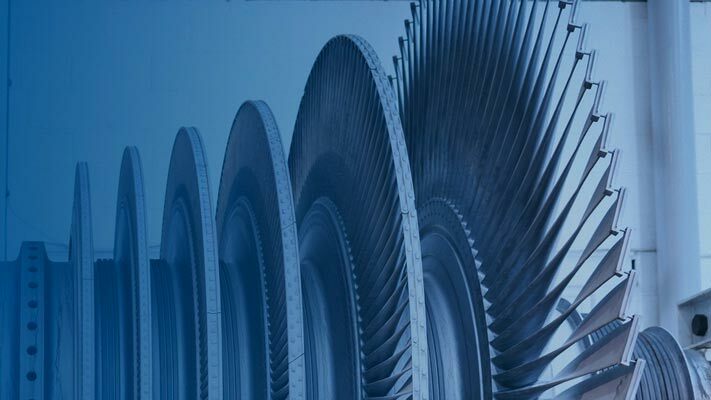 Therefore, one discharging or charging process would take around 2 hours (7200 seconds). The maximum change is 100% for SOC and around 4 volts for . The measurement noise is estimated based on measurement equipment accuracy. A voltage meter for battery voltage measurement has approximately 1% accuracy. The battery voltage is around 4V. Equivalently, we have . Therefore, set . where is the number of discharge-charge cycles and is the process noise. The battery is configured to automatically charge when the battery state of charge is at 30% and switch to discharging when state of charge is at 90%. Use this information to measure the battery capacity by integrating the current over a charge or discharge cycle (coulomb counting). A: . In this example, . As a result, equals 1 all the time. Initial states x: 30. It is the nominal capacity of battery (30Ah). This is the covariance of the process noise . Since degradation rate in the capacity is around 1 Ah per discharge-charge cycle, set the process noise to be 1. R: 0.1. This is the covariance of the measurement noise . Assume the capacity measurement error is less than 1%. With battery capacity of 30 Ah, the measurement noise . Click Options to add input port Enable to control measurement updates. The enable port is used to update the battery capacity estimate on charge/discharge events as opposed to continually updating. Note that setting Enable to 0 does not disable predictions using state equations. It is the reason why the state equation is configured to be event-based as well. By setting an event-based A and Q for the Kalman filter block, predictions using state equations are disabled when Enable is set to be 0. To simulate the system, load the battery parameters. The file contains the battery parameters including , , and etc. At every time step, the unscented Kalman filter provides an estimation for SOC based on voltage measurements . Plot the real SOC, the estimated SOC, and the difference between them. After an initial estimation error, the SOC converges quickly to the real SOC. The final estimation error is within 0.5% error. The unscented Kalman filter gives an accurate estimation of SOC. At every discharge-charge transitions, the battery capacity is estimated to improve the SOC estimation. The battery system outputs indicator signals to inform what process the battery is in. Discharging process is represented by -1 in the indicator signals while charging process is represented by 1. In this example, changes in the indicator signals are used to determine when to enable or disable Kalman filter for capacity estimation. We plot the real and estimated capacity as well as the charge-discharge indicator signals. In general, the Kalman filter is able to track the real capacity. There is half cycle delay between estimated capacity and real capacity. It is because the battery capacity degradation happens when one full discharge-charge cycle ends. While the coulomb counting gives a capacity measurement of the last discharge or charge cycle. 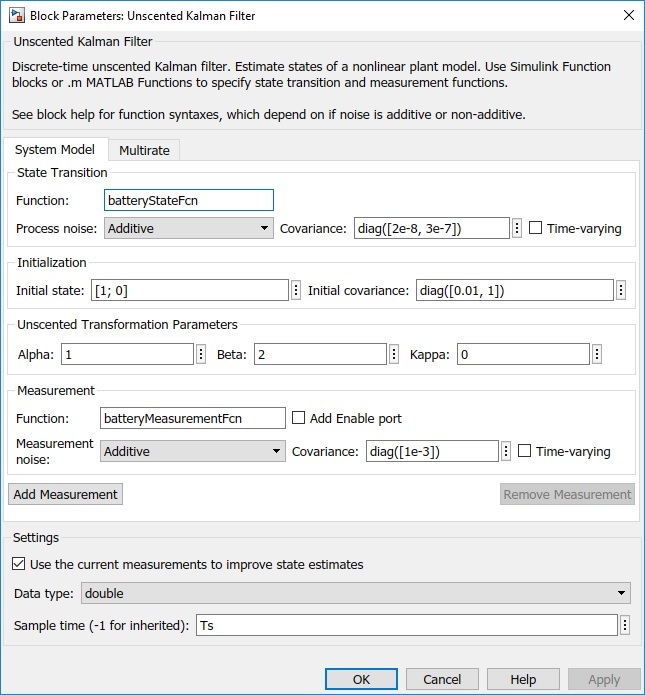 This example shows how to use Simulink unscented Kalman filter block to perform nonlinear state estimation for a lithium battery. 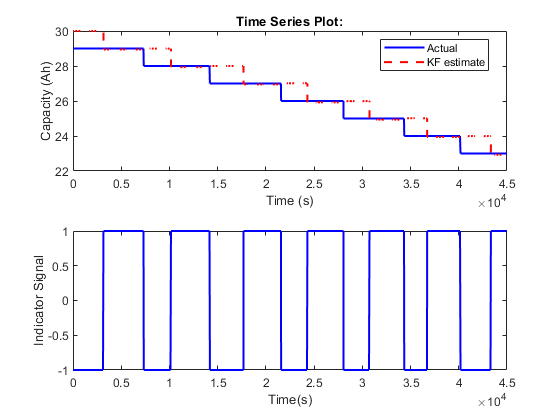 In addition, steps to develop an event-based Kalman filter for battery capacity estimation are illustrated. The newly estimated capacity is used to improve SOC estimation in the unscented Kalman filter.